DO NOT EXCEED RECOMMENDED DAILY INTAKE. USE ONLY AS DIRECTED. Directed Use On Training Days: To determine tolerance, begin by taking one serving (1 scoop) mixed with (4 - 6 oz.) of water 20 - 30 minutes before training. After personal tolerance has been assessed, take one to two servings (1 - 2 scoops) 20 - 30 minutes before training begins. Add (4 - 6 oz.) of water for each serving. During your workout, it is recommended that you drink plenty of water. Ascorbic Acid, N-Acetyl-L-Tyrosine, Caffeine Anhydrous (135mg), Mucuna Pruriens [Standardized For L-Dopa], Advantra Z® (Bitter Orange Fruit (Citrus Aurantum) [Standardized For Synephrine]), Niacinamide, Folic Acid, Pyridoxal 5-Phosphate, Methylocobalamin. Natural & Artificial Flavors, Calcium Silicate, Malic Acid, Citric Acid, Silicon Dioxide, Sucralose, FD&C Yellow #5, FD&C Blue #1, Acesulfame Potassium. : This product may contain legal dietary ingredients that are prohibited by individual sports organizations. Due to the unique restrictions of some amateur and professional sports organizations, obtain approval and/or authorization before beginning use of this product. Natural And Artificial Flavors, Citric Acid, Malic Acid, Silicon Dioxide, Calcium Silicate, Sucralose, Artificial Color (FD&C Yellow #5), Acesulfame Potassium (Ace-K). Natural & Artificial Flavors, Citric Acid, Silicon Dioxide, Malic Acid, Calcium Silicate, Beet Juice (Color), Sucralose, Acesulfame Potassium (Ace-K). Natural And Artificial Flavors, Citric Acid, Malic Acid, Silicon Dioxide, Calcium Silicate, Sucralose, Acesulfame Potassium (Ace-K), FD&C Blue #1. What is NO3? NO3 is Nitrate, an advanced compound that delivers unbelievable muscle pumps and amplifies the effectiveness of every ingredient in C4 Extreme. Cellucor is utilizing a new compound where NO3 has been fused to Creatine to create Creatine Nitrate; according to a UCLA study, Creatine Nitrate is 1000% more water soluble than either Creatine Monohydrate or other creatine derivatives. Unmatched water solubility ensures better absorption and absolutely none of the traditional side effects of Creatine supplementation. C4 can be taken with P6 Extreme for an explosive muscle-growth stack. C4 Extreme and NZero can be mixed for an ultra-lean, high-energy preworkout. 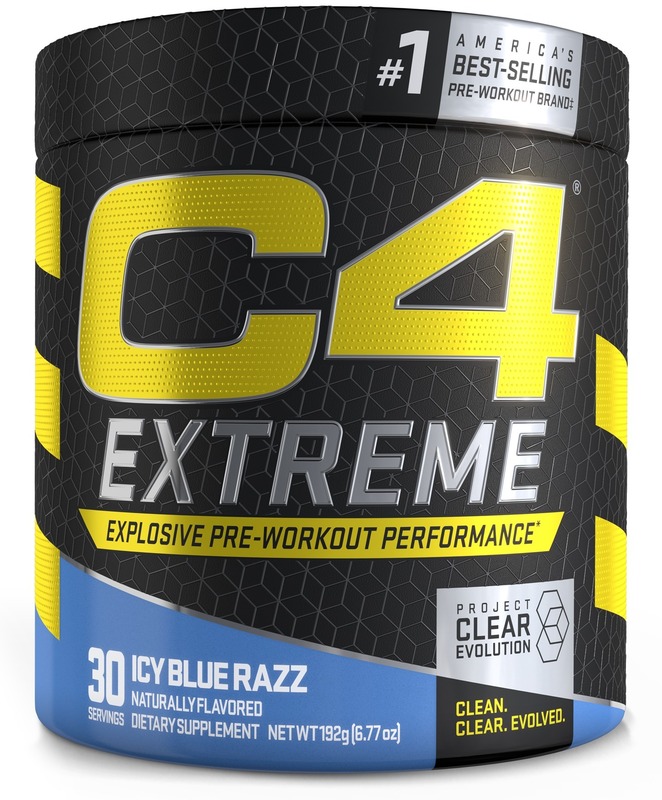 C4 can be stacked with any of Cellucor’s non-stimulant weight loss options and/or D4 Thermal Shock once personal caffeine tolerance levels are assessed.